Nancy achieved her Diploma in Dental Hygiene and Therapy, Kings College hospital, London in 2007 and joined the practice in 2013. Nancy has been working in Dentistry for 15 years, initially as a Dental Nurse. 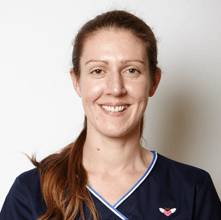 She qualified with a merit in Dental Hygiene and Therapy from Kings College University in 2007, Nancy is a member of the British Association of Dental Hygiene and Therapists and regularly attends postgraduate courses to keep her skills and knowledge up to date.